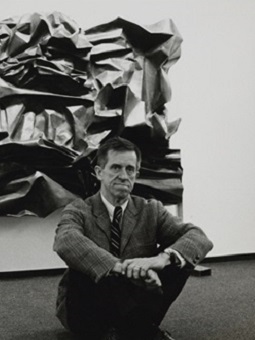 Abbott Pattison was a Chicago–born sculptor most known for his abstract, bronze sculptures. Pattison had close connections with his birthplace, where more than twenty of his works are located (including Processional, which is sited in the Social Service Administration Building at the University of Chicago). He also taught in the School of the Art Institute from 1946–52 and lived in Winnetka, Illinois for thirty–five years, until he moved to Maine in 1993. Despite his strong connections with Chicago, his career was marked by constant movement. He received his initial training at Yale University, where he received both a Bachelor of Arts in 1937 and a Bachelor of Fine Arts in 1939. After serving in U.S. Navy during World War II, he returned to Chicago and resumed his sculptural career. Since the early 1950s, he worked and taught extensively across the U.S. and Europe, such as serving as sculptor in residence in the University of Georgia and working in France and Italy. His career in Florence, where he maintained a relationship with a bronze-casting facility, had a special impact on him. Ever since his residence in Florence in 1950s, he returned to the city every couple of years to cast sculptures and immerse himself in Renaissance art. “Greek and Renaissance ideas have been inescapable influences,” he once noted in an interview. Pattison held many one-man exhibitions across the country, mostly in Chicago and New York. His works are permanently collected in the Art Institute of Chicago, the Metropolitan Museum of Art and Whitney Museum in New York, and the Israeli State Museum, among many others.